The Ferrari F40 - a super car built specifically to celebrate 40 years of Ferrari's legacy both on the race track and the open road. When it comes to automobile manufacturers, there are few who rival the performance, the allure or the mystique of those found in the Italian Sports Car market. For the past half century, companies like Lamborghini, Maserati, Lancia and, more recently Pagani and Spada Vetture Sport, have showcased some of the fastest, most seductive, and most powerful automobiles the world has ever known. Yet, as successful as each of these companies are, there is no other automotive manufacturer from Italy (or, arguably, pretty much anywhere on the planet) that has captured the imagination of automotive enthusiasts like Ferrari has. Since its founding as an automotive manufacturer in 1947, Ferrari has been responsible for introducing many of the most popular, most successful, and most desired sports cars of any manufacturer ever. 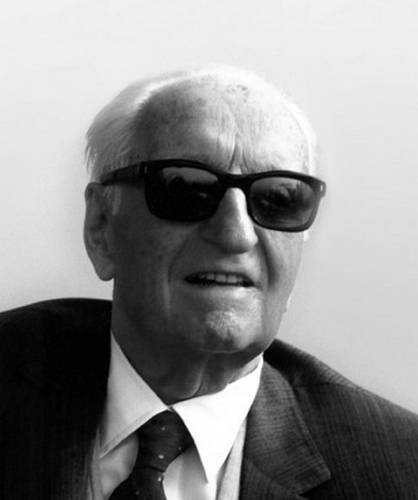 Enzo Ferrari, Founder of the Ferrari Automobile Corporation. Enzo Ferrari began his company as Scuderia Ferrari S.p.A. in 1939. His initial business model was to build a team that would buy, customize, and field race cars built by Alfa Romeo. Within a few short years, Enzo recognized that he could accomplish more on the racetrack by building his own cars, and set to work on the Ferrari 125 S – the first (of many) cars to officially wear the Ferrari badge. For the next forty years, the Ferrari corporation, led by Enzo Ferrari himself, would create some of the fastest, most luxurious sports cars the world had ever seen. While Ferrari began building production vehicles fairly early in its tenure as an automobile manufacturer, it was always Enzo’s intention to use his production vehicles to generate revenue to fund his racing aspirations – both as a driver and as a team owner. Despite this, and amidst controversy throughout his long career, Enzo would go on to oversee the design and production of all the cars his company produced – both for the track and for commercial sales. To celebrate Ferrari’s 40th anniversary, it was decided that the company would produce a mid-engine, rear wheel drive, two-door coupe sports car. It would be the fastest, most powerful car the company had ever built. This car, appropriately enough, would be called the Ferrari F40. 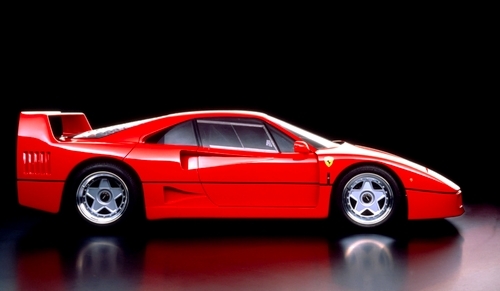 The Ferrari F40 was built out of Enzo’s desire to leave a legacy in his final supercar. His vision was to build a street legal vehicle that was developed directly from a track-ready race car. Ironically, the F40, which was the byproduct of that vision, came into being by unfortunate happenstance. Five Ferrari 288 GTO Evoluzione’s were developed to compete in the FIA Group B Class Racing. Unfortunately, the series was disestablished due to a number of fatal accidents. As early as 1984, Ferrari’s Maranello factory had begun development of an evolution model of the Ferrari 288 GTO which was specifically designed to compete against Porsche’s 959 in Federation Internationale de l’Automobile (FIA) Group B Class Racing. However, after a series of major accidents – some of them fatal – the FIA Group B Class was disestablished, which left Enzo Ferrari with five 288 GTO “Evoluzione” development cars, and no series in which to campaign them. Four of the five “Evoluzione” models were eventually sold to private clients, but the fifth remained at Ferrari’s factory. Enzo recognized that if the 288 GTO could be transformed from a performance street machine into a full-on racer, it seemed plausible that the reverse could be true as well. Utilizing the last remaining Ferrari 288 GTO Evoluzione as a starting point, Ferrari set about manufacturing the F40 with a singular focus – build a street car that performed and handled like a race car. It made a great deal of sense, therefore, that much of the F40 evolved from variations to the mechanical components developed specifically for the 288 GTO. The Ferrari F40 utilizes a 2.9L (2936 cc) V8 engine that boasted an impressive 479 brake horsepower at 7,000 rpm. At its core, the car was powered by an enlarged, mid-mounted 2.9L (2936 cc) version of the GTO’s IHI twin-turbocharged V8 engine. In alignment with the development work performed on the “Evoluzione” variant of the 288 GTO, the F40’s future engine received a small increase in capacity, a slightly higher compression ratio of 7.7:1, a rise in boost pressure, and a number of other changes that resulted in a respectable improvement in the engine’s power output and torque. The engine’s total cubic capacity was 2936cc, with an 81.9mm x 69.5mm bore and stroke. It’s factory type reference (comparable to an RPO – Regular Production Option – on U.S. built cars) was F 120 A. The engine had four valves per cylinder and twin overhead camshafts per bank. Each bank was provided with its own toothed drive belt, a dry sump lubrication system, twin IHI water-cooled turbochargers (which fed the intake air by means of a pair of Behr intercoolers at 1.1 bar.) The air intake system was coupled to a Weber-Marelli IAW combined ignition/fuel injection system. 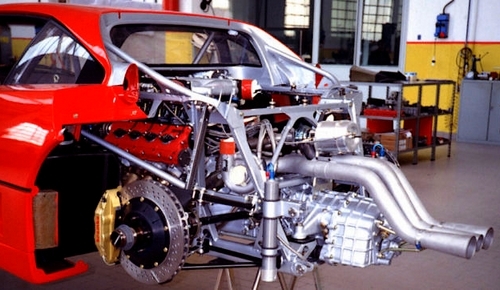 The differential assembly of the Ferrari F40 was mounted to the back of the engine in conjunction with the rear mounted, five-speed, all synchromesh gearbox. A non-synchromesh “sport” gearbox was also offered to consumers as an option for those individuals that wanted to take the concept of a “street-legal race car” to the extreme. 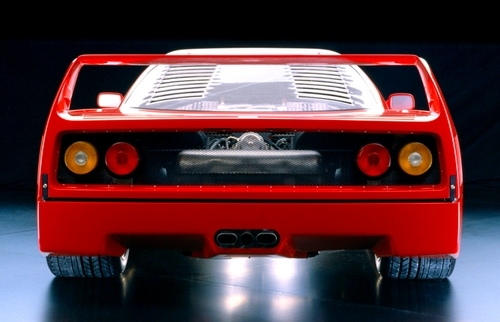 The Ferrari F40 utilized a three pipe exhaust system. The center pipe was designed to exhaust gases from the turbochargers’ wastegates. The F40’s differential was mounted directly to the back of the engine. During development (and certainly one of the more interesting aspects of the car’s design) it was decided that the F40 would utilize a three-pipe exhaust system. The two flanking exhaust pipes would serve the purpose of a conventional exhaust system from each cylinder bank of the engine while the central pipe was included to exhaust gases released from the wastegate of the turbochargers. The Ferrari F40 featured a suspension setup that was similar in design to the GTO’s double-wishbone setup. However, much of the original suspension hardware was upgraded and most of the settings were changed. Given the F40’s intentionally (though unusually) low ground clearance, Ferrari developed the suspension with the ability to increase the vehicle’s ground clearance when necessary. Both the F40’s front and rear suspension consisted of independent, unequal-length wishbones with coil springs over telescopic, hydraulic shock absorbers. Both front and rear also included an anti-roll bar. The aforementioned adjustable ground clearance was achieved by means of an electronically controlled suspension system that was introduced midway through the car’s six-year production run. The car was supported on a set of five-spoke Speedline manufactured split rim units attached to the car by a single, central nut to a Rudge hub. The front wheels measured 8J x 17” in diameter and were paired with either 235/45 ZR 17 or 245/40 ZR 17 tires. The rear wheels measured 10J x 17” in diameter and were paired with 335/35 ZR 17 tires. The car also featured rack and pinion steering as well as four-wheel disc brakes. The Ferrari F40 body is comprised of 11 separate body panels. Although inspired by some of the cars that came before it, the Ferrari F40’s body was an entirely new design. Developed by the Italian Design and Engineering group Pininfarina, the F40 was unique not only in appearance, but by the fact that it was the first series production car ever to use mainly composite materials – including Kevlar, carbon fiber and aluminum – for all of its body panels. The materials were chosen both for their durability and low weight. Weight was further minimized through the use of a plastic windshield and windows. The first fifty production cars were actually equipped with sliding Lexan windows, though the design was later changed and the cars were fitted with more conventional roll-down windows. The entire body of the F40 consisted of a mere eleven pieces, due mostly to the fabrication of a single large unit for both the front and rear sections of the car. The reduction in individual body components also reduced seams/gaps in the surface area that could cause drag during high acceleration. Despite this, an intense aerodynamic testing process was implemented throughout the design phase of the car. Whereas the GTO’s chassis had a bolted rear section that was designed to simplify engine removal, the F40’s rear section was fully removable, which provided complete access to all of the car’s mechanical components. The interior of the F40 was sparse – it lacked carpeting of any sort, and notably lacked a number of features – including a radio and storage compartments – found on most similarly priced automobiles. Notice the “blank” panel where a glovebox would normally be located. 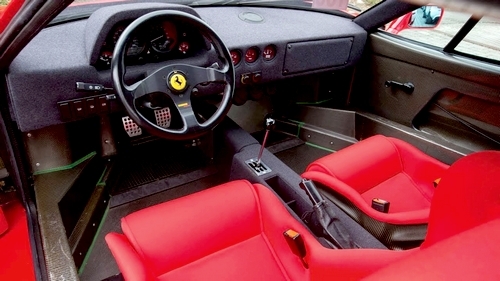 The Ferrari F40’s interior looked more like the cockpit of a race car than any production vehicle previously produced by the Italian supercar manufacturer – and with good reason. Afterall, the car was developed from its racecar brethren and retained many of the design elements – both functionally and aesthetically – found in the GTO’s cabin. Race-style seats with massive side bolsters greet the driver upon entering the cabin. Finished in a bright red and capable of hosting a three-point harness (thanks to intentionally placed guide holes in the seats upper back), the connection between race car and production car is unmistakable. The interior lacks any type of carpeting. Instead, the floor is finished in an uncovered composite material. The dashboard is covered in a simplistic, grey-felt material (and lacks the fit and finish of other cars found at a similar price point.) Even the headliner is made of a rather generic-looking perforated vinyl. While straight-forward in its design, the F40’s dashboard was intuitively setup to provide the driver immediate access to any/all information pertinent to vehicle operation. 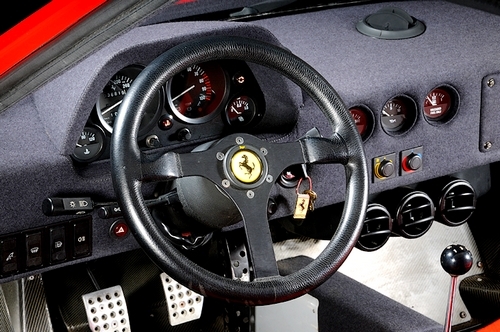 The Ferrari F40 did include air conditioning, but excluded any type of stereo/sound system. Also absent from the dashboard was a glove box. In fact, save for a single pocket on the interior of each door, the F40 lacked any kind of interior storage space whatsoever. Worse still, door handles were notably missing from the interior door panels. Instead, a generic cable was attached to the door panel that enabled occupants to pull the door shut upon entering the car. Once the driver climbed over the large side sills and into the racing-inspired seats, the aesthetic of the cockpit dissolved into the realization that the Ferrari was built for speed. A beautiful, three-spoke Momo steering wheel and a well-placed gear-shifter is placed perfectly to support the driver’s ergonomics. The shifter itself is comprised of a thin chrome stalk, capped by a round black plastic knob. The dashboard itself featured a set of gauges including a speedometer with a top-speed of 220mph, a tachometer that red-lined at 7,750rpm, oil pressure, fuel tank level and oil temperature gauges, and, of course, a turbo gauge that measured pounds of boost. While the interior may have lacked almost all of the luxurious appointments and finishes that other sports cars/supercars were known for, it became clear to anyone entering the cockpit of the F40 that the car was never intended to be luxurious – it was intended to go fast. The F40’s body was mounted on a chassis with a wheelbase measuring just 96.45 inches (2450 mm) – the same as the GTO – but both the front and rear tracks were widened – the front track to 62.76 inches (1594 mm) and the rear track to 63.23 inches (1606 mm). The overall length of the car was also increased from that of the GTO – 171.57 inches (4358 mm) in total – due mostly to the longer and more aerodynamic nose. At it’s widest, the car measured 77.56 inches (1970 mm), which was more in keeping with a race car than a street car. Similarly, the car stood a mere 44.21 inches (1123 mm) tall, due in part to its low ride height/ground clearance. 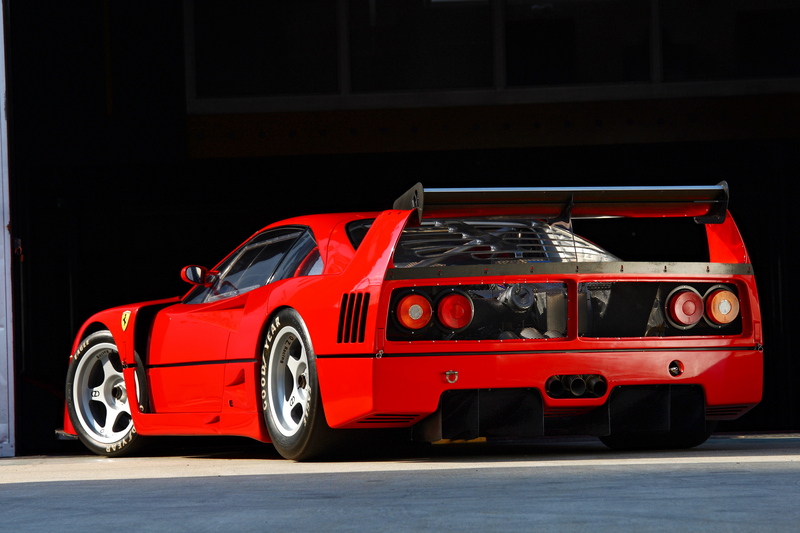 The F40 utilized a number of components – including a large rear spoiler – to increase downforce during operation. Beneath the surface, the F40 followed Ferrari’s principle of chassis fabrication via use of a tubular steel frame. The design premise was similar to that found on the GTO, though the F40 utilized additional stiffening braces for increased rigidity. Additionally, many of the composite elements were bonded to the chassis with a special adhesive which was designed to provide even greater strength. The one exception to the car’s overall structural rigidity was built into the front quarter of the car. While the car’s structural strength was paramount to the car’s ability to perform in even the most extreme driving conditions, the F40 utilized a progressively deformable front section to meet the increasing crash-test/safety legislation being imposed worldwide. In the event of an accident, the front end would be able to absorb much of the impact, protecting the vehicle’s occupants. 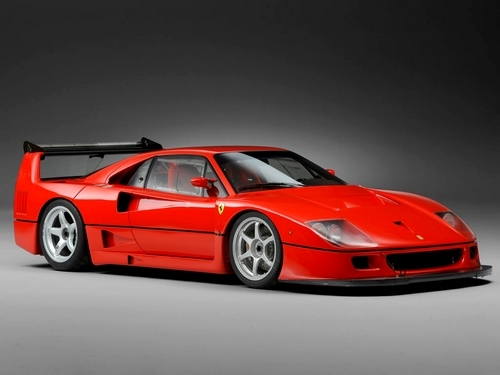 The F40 was specifically designed with aerodynamics in mind. While the car’s powerplant was capable of producing impressive horsepower and torque numbers, the car actually relied more heavily on its shape than its power for achieving maximum speed. 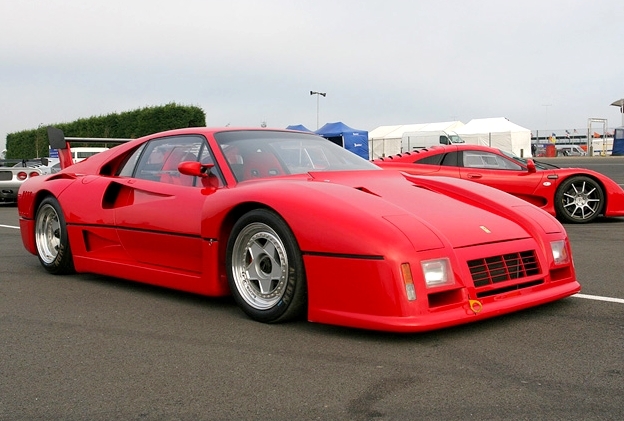 Despite the increases to length and width, the F40’s frontal area was actually less than that of its GTO predecessor. This reduction in area, combined with careful design cues to reduce/eliminate drag, helped ensure that the F40 had an extremely low drag coefficient of just 0.34. While building a fast car was paramount, Ferrari’s focus was centered on developing a car that blended extreme velocity with stability. Several key items were implemented to ensure that air moving beneath the car would not cause drag. It featured a partial undertray which was designed to smooth airflow beneath the car and up-and-into the radiator, and it featured a second undertray with diffusers which were located behind the car’s engine. However, given the great deal of heat generated by the engine itself, the area beneath the engine area was not sealed. Lift was reduced (and drivability at high-speed increased) with the introduction of a larger spoiler and rear wing. In total, 1,311 (though some report 1,315) Ferrari F40 cars were manufactured between 1987 and 1992 at the Maranello plant. When it was announced that Ferrari was going to manufacture a street-legal race-car inspired supercar for their 40th anniversary, enthusiasts were elated. 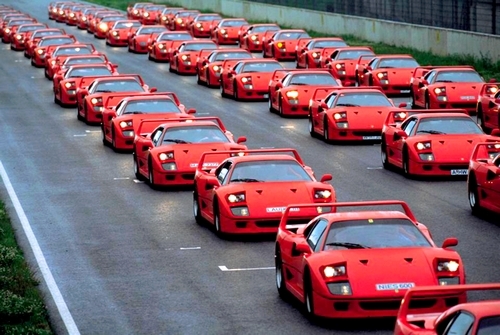 Ferrari planned a total production of just 400 units of the F40. While Enzo’s intention was to produce the F40 solely as a street-production vehicle, FIA nonetheless required a minimum of 200 production units to be produced in the event that the F40 were to compete in any Group B racing events. By the time production of the car was officially launched, Ferrari insisted that no more than 400-450 examples of the car would ever be produced. The Ferrari F40 debuted in 1987 and was offered to consumers at a suggested retail price of approximately $400,000.00 (which, when adjusted for inflation, would be nearly $862,000 at the time of this article’s publication.) While this number might seem high to most consumers, the actual demand for the car was so great that it sold for considerably more than the suggested MSRP, with alleged sales numbers reported as high as $1.6 million dollars. Ferrari produced a total of 1,311 units (some say 1,315) of the F40 in their Maranello plant over the entirety of the car’s production – due completely to the car’s extreme popularity. While Ferrari purists clamored for the F40 from the very beginning, the automotive press was split on their opinions of the car when it was unveiled in 1987. Road & Track Magazine praised the car’s appearance, but many of the other keep publications were unimpressed. 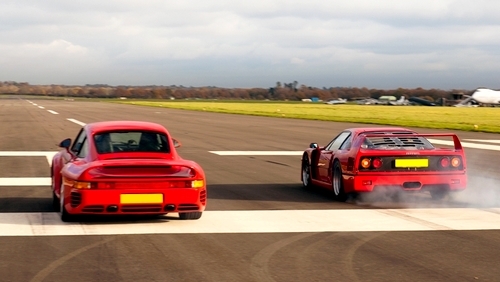 The Ferrari F40 and the Porsche 959 are both the bi-product of the FIA Group B racing class. 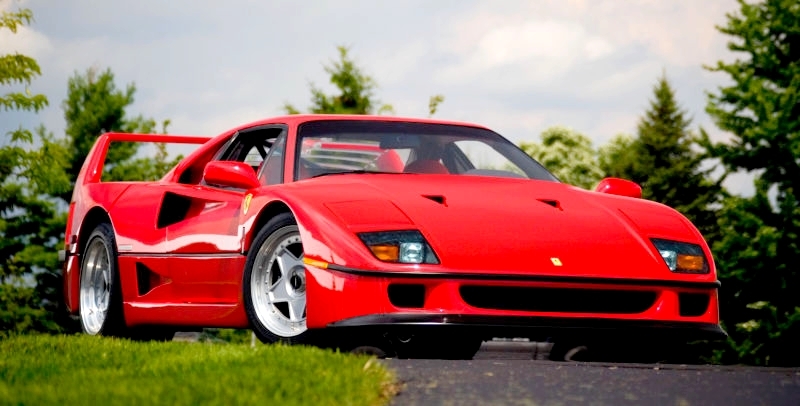 One significant criticism that seemed to resound within the automotive community is that Ferrari had built the F40 in an attempt to “cash-in” on enthusiasts after seeing how much money they’d pay for a used Ferrari 288 GTO, as well as the high market demand for the Porsche 959, which was considered to be the F40’s only comparative rival at the time. In 1988, in an effort to try and sway the opinion of the critics, Ferrari invited journalists to test the Ferrari F40 alongside a Porsche 959 at their home track – the Fiorano Circuit. Car Magazine and Automobile Magazine each published a detailed article comparing the two cars and, while both conceded that the F40 was the faster, more powerful machine, they also agreed that the Porsche 959 was the all-around better car. 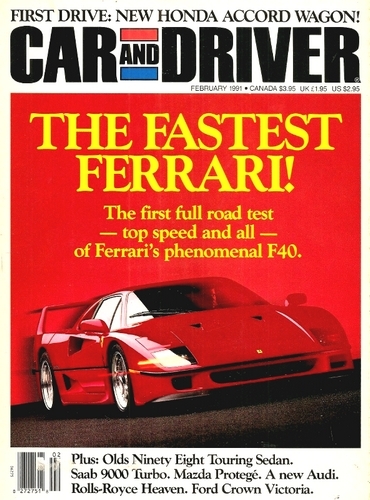 The Ferrari F40 was reviewed by Car and Driver Magazine for their February, 1991 issue. Despite the critics, the car’s popularity amongst Ferrari enthusiasts and owners remains unshaken until this day. When asked why, especially when even the most devout F40 fans will acknowledge the cars propensity to break down or fail to start frequently, the answer is almost always the same – there is just nothing else like it on the road. Perhaps the article “Ferrari F40 Buying Guide” written by Peter Tomalin (and published in Evo Magazine in January, 2013) summarizes the experience of owning an F40. Where the F40 may have lacked finesse in its overall design, its light curb weight and high-power output were the primary focus of the Ferrari’s engineering team. As previously stated, the F40 weighed in at just 3,018lbs (1,369 kg) while producing 471 horsepower (352 kW) at 7,000 rpm, which meant the car had tremendous potential thanks to its intentionally engineering power-to-weight ratio. While Ferrari did not publish any official acceleration or top speed metrics at the launch of the Ferrari F40, the claim made by Ferrari was that the car could achieve a top speed of 213 mph (342 km/h). While automotive journalists were slow to warm to the car’s aesthetics or build quality, they would nonetheless quickly began to push the car to its operational/performance limits – and the numbers were breathtaking. In 1988, the French magazine Sport Auto published that the F40 had a 0-100 km/h (62 mph) time of 4.7 seconds and a top speed of 321 km/h (199 mph). The German magazine Auto, Motor und Sport tested two Ferrari F40’s at the Nardò Ring (located in Nardo, Italy.) As before, neither car could be pushed beyond the 199 mph mark, although other cars on the track that day – including the Porsche 959 S and the Ruf CTR – were able to push well beyond the 200mph barrier. While it was never Enzo Ferrari’s intention to put the F40 on the racetrack officially, it seemed unavoidable that a high-performance supercar such as this would eventually find its way onto a racetrack. Daniel Marin, of Charles Pozzi SA, successfully lobbied Ferrari to authorize Michelotto of Padova to produce a series of race car variants of the F40 that adhered to IMSA rules, enabling the “world’s fastest production car” to have its day on the racetrack. The Ferrari F40 LM was more radical, exclusive and exciting than the already extreme F40. A specially prepared engine, which produced between 850-900 horsepower, was developed for the LM. The car boasted a 0-60 time of just 3.1 seconds, a 0-100 time of just 6.5 seconds and a top speed of 230 mph (380 km/h). The chassis was revised and a more aggressive body kit was developed for improved aerodynamics and added downforce. Similarly, a race inspired front and rear wing was developed to maximize downforce on the racetrack. The F40 LM’s brakes, suspension and gearbox also received enhancements as part of the LM treatment. Wider wheels and tires were added. In an effort to reduce weight, the car’s interior was stripped down even further than the already sparse interior of the production model F40, and the flip-up headlights were replaced with fixed lamps behind Lexan covers. When completed, the F40 LM weight just 2,314 lbs. A total of just two Ferrari LM (Le Mans) edition were initially built for the 1989 racing season. The Ferrari F40 LM made its racing debut in early 1989 when it appeared in the GTO category of the IMSA racing program at the Laguna Seca Raceway. The car, a special edition LM (Le Mans) model of the famed F40, was piloted by Jean Alesi, and finished in third place behind a pair of four-wheel-drive Audi A90’s. The F40 LM would continue racing throughout the remainder of the season and earn an additional three- second place finishes and one – third place finish. The Ferrari F40 LM/Competizione is considered one of the most exotic sports cars ever built, and remains a favorite among Ferrari owners today. While the F40 LM proved beyond doubt that it was a capable contender on the racetrack, Ferrari felt that the Le Mans tag was too restrictive, and decided instead to rename the Ferrari F40 LM. In keeping with Ferrari’s racing tradition, the F40 LM became known as the Ferrari F40 Competizione. Although the Ferrari F40 LM/Competizione would not return to IMSA for the following race season, it would become the popular choice of privateers to complete in a variety of domestic GT racing events. Ironically, the Italian supercar would not race in international competition until 1994, when a single F40 Competizione participated in the BPR Global GT Series, winning at the 4 Hours of Vallelunga. For the 1995 racing season, a total of four F40 race cars were fielded. These cars were developed independently by Pilot-Aldix Racing and Strandell and would only win a single race that year – the 4 Hours of Anderstorp. While an incredible competitor in its day, newer – and faster – race cars, like the McLaren F1 GTR, were dominating the racing circuits around the globe, leaving the F40’s future on the racetrack to speculation and uncertainty. Although the Ferrari F40 would return once more for the 1996 racing season, and would again win the 4 Hours of Anderstorp race event, it would never again return to dominance on the racetrack and retired from competition later that same year. A total of just 19 Ferrari F40 LM/Competizione race cars were built between 1989 and 1994, making it one of the most collectible supercars of all time. In August, 2015, a 1994 Ferrari F40 LM crossed the auction block at Sotheby’s in Monterey and sold for a staggering $3.3 million dollars.